Why oh why didn’t Laurel make the Big Move™? This week, she even explicitly noted that she absolutely knows she can’t beat Dom or Wendell. She knows! So why won’t my Winner Pick™ finally do something about it? That’s what everyone’s wondering, right? Me too. Jeff put together a nice primer on why it’s not a simple thought, why Laurel might be making the right choice. Now, far be it from me to disagree with my Leader, but I have to say: Jeff’s column makes Laurel’s decision seem like a binary. She either goes with Dom and Wendell and loses to them, or goes with Kellyn and Chelsea and loses to them. I would agree: Laurel does lose to either of those twosomes. But would she lose against SeaBass and Angela? Angela and Donathan? Heck, in a final tribal, is there any doubt she has better chances again Kellyn than she does Wendell or Dom? I don’t think so. And nothing prevents Laurel from voting out Wendell this week, forcing Dom to use an idol next vote and then gathering the people on the bottom to take out Dom. Right? This could happen. So why did Laurel, an exceptionally bright human, do what she did? That’s where expected utility theory provides some answers. The theory, first really introduced by a Swiss mathematician multiple centuries ago, basically helps us assess how people – or in a lot of research, businesses – make or don’t make risky decisions. When you think about it, we make a lot of risky decisions – some riskier than others – every single day. I mean, it could be as simple as eating something bad for you like a cheeseburger, or something riskier like, say, riding a bike without a helmet or not wearing a seatbelt or skydiving. For each and every decision, we typically understand the risks inherent in them, but sometimes we decide to take the risk. Why? It’s because, with or without even thinking about, we tend to do some mental calculus. For us to make a risky decision, according to the theory, we think about four specific contexts: completeness, transitivity, continuity, and independence. What do these mean? Well, for completeness, it means we can clearly see the well-defined options. We know our options incredibly well. For transitivity, it means that in similar situations, we make similar decisions. This is the idea that we don’t suddenly do something against type: Risk-averse folks are going to be risk-averse. However, we also must acknowledge that every situation is different. Making a Big Move™ in Survivor is not exactly the same as heliskiing when you’ve never skied before. Continuity is all about, really, the idea that there are always other decisions that a person is indifferent to and exclude from thought. Finally, independence basically hypothesizes that a person will always prefer one option over the other, regardless of how it’s broached. So this is all a little complicated, I know. Usually these contexts, or axioms, are figured out using math and I’m applying this theory more as a thought experiment. But, stay with me here: Laurel, I think we can say, is a risk-averse person in general. So am I. That means it’s going to be harder for us to see the utility in making a risky decision. But, here, we know Laurel understands the utility – she told us she does! So why not make it? I’m thinking this is where Jeff’s column makes a lot of sense. I think Laurel is thinking in binary terms. 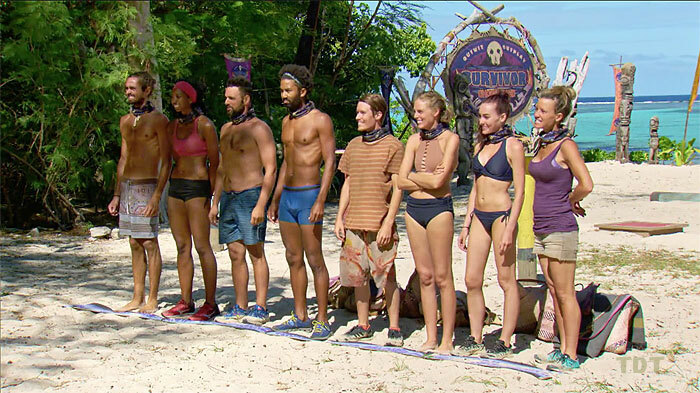 We know that in modern-day Survivor, winning players usually move between alliances to win. Pagongings just aren’t very common anymore. If we think of the theory, completeness is the first axiom and that’s Laurel’s problem. To make a risky decision, you need to understand the options; they need to be well defined. 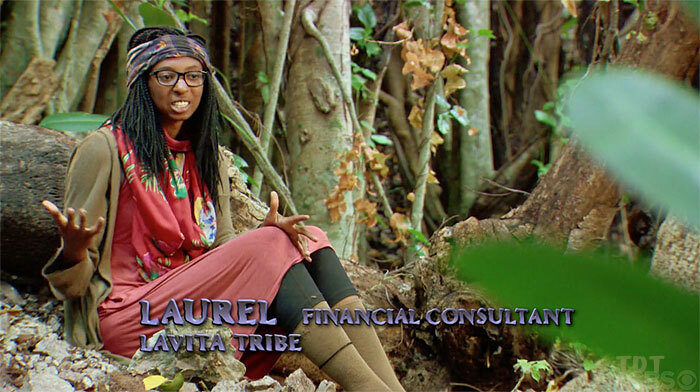 Here, Laurel is seeing this as an either-or decision: She goes to the end with Dom and Wendell and loses, or she gets eliminated at four with Kellyn, Chelsea and Angela. That’s why she makes the decision she does. I don’t agree with it, but I think expected utility theory helps us understand her side. She just doesn’t see the utility of making the Big Move™ right then. Angela: It’s funny: Anytime Angela talks strategy, even when it’s not, you know, real strategy, she always seems so very intense. It makes me laugh every time. Strategy makes her angry or something. And that makes sense because Angela, to me, doesn’t really engage in much actual strategy. She’s got fifth place written all over her. Sebastian: I have to say, I’m kind of amazed SeaBass is still standing. How is this dude still in the game? I guess it’s because he’s both a physical and strategic no-show. People don’t really care all that much about SeaBass. I think he’s gone this week. Donathan: I have mixed feelings about Donathan’s performance, if you will, at tribal last week. I mean, I guess you could say he was trying to get Wendell to play his idol? But why go so over the top? And because it didn’t work, maybe we can assume he wasn’t trying to trick Wendell? I really have no idea. And that really sums up Donathan’s entire season: I just have no idea. My prediction is he comes in fourth. 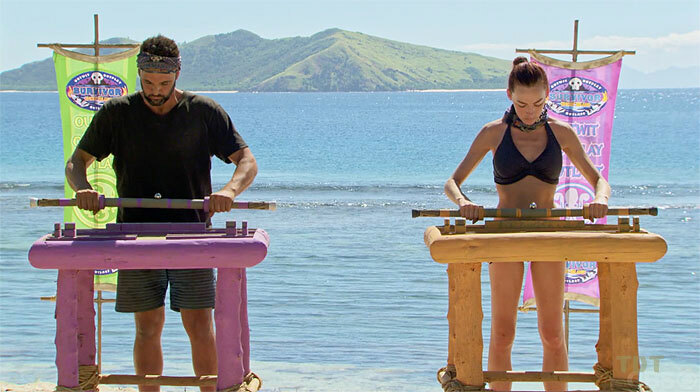 Domenick: We’re heading into the second-to-last episode, there are only seven castaways remaining and yet I’ve already gone through three without reaching someone who can win. So, yeah, we’re finally there. Dom can win this game. In fact, these two immunity wins in a row, I think, seal the deal. I think Dom wins the entire thing. Laurel: As we’ve already discussed, Laurel is turning into the most controversial player of the season. I get that she deserves some credit for making it this far and I get that she played a damn good game in the pre-merge festivities, but this week finally doomed her. Yeah, she might not have had a chance against the Naviti women, but it would have been a hell of a lot better than with Dom and Wendell. Heck, I’m not sure she can beat Donathan in the end. Laurel comes in third. Kellyn: On one hand, Kellyn finally realized that she couldn’t steer the Naviti ship all the way to the win. I mean, she figured it out about six weeks late, but she got there. The only problem is, seemingly, she made no real inroads in terms of a relationship with any non-Naviti. And that means when you need new alliances, folks simply aren’t going to trust you. Kellyn makes the finale, but comes in sixth. Wendell: While I think his star is starting to fade, you have to give Wendell credit for two things this week. First, volunteering to head to Ghost Island, regardless of the outcome, made complete sense. And, second, not playing that idol took lots of courage and will certainly help him moving forward. He comes in second. Well, let’s try to enjoy the slog to the end, my friends.